Elegant lace sash for the Bride who won't settle for anything less than exquisite! These handmade sashes make a perfect gift that she can hold onto and cherish long after walking down that aisle. Each of our sashes are handmade in our Houston studio. 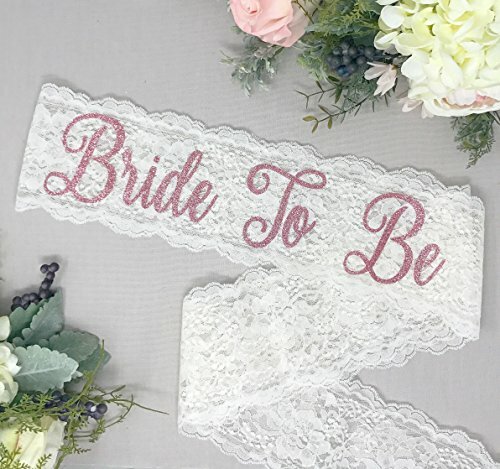 Stunning ivory scalloped lace make a gorgeous sash with rose glitter "Bride To Be" in a fun script font. Glitter will not flake off or create a mess. These sashes are made extra long measuring at 72" and clasp together with a pin to keep the sash in place. The lace is somewhat translucent as it doesn't take away from the Brides outfit. Packaged in a delicate organza bag, ready to gift.